I met Bob Howe at the Yankee Sportsman’s Classic back in January. 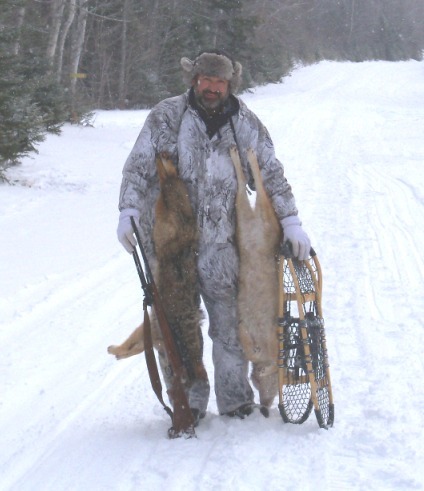 Bob is Registered Maine Master Guide, the owner of Pine Grove Lodge, and was a seminar speaker on hunting snowshoe rabbit (hare) and coyotes. Bob starts his seminars by stating that he “just does this for a living, but doesn’t have all the answers.” He may not have all the answers, but I haven’t thought of the questions that he can’t answer. Of course, being mildly ADD, I couldn’t get past the fact that Bob has a kennel of 27 beagles. That’s more than two baker’s dozen (in Vermont donut speak)! Hunting snowshoe hare and hunting coyotes goes together. Shooting coyotes protects the hare and deer populations and gives Bob’s guests something to do at night when they aren’t hunting hare. Who’d want to stay all cooped up lying in a soft bed in a comfortably warm lodge in the middle of a Maine winter when you could be out most of the night sitting in a blind (portable heater provided) hunting coyotes? Apparently quite a few people, at least for one night. From what I understand, there are no wolves in Maine. Some “sports” have a difficult time telling the difference. One sure way to tell the difference is that if you shoot a wolf it results in a fine of several thousand dollars. If you shoot a coyote, no problem. It stands to reason that there are no wolves in Maine. Coyote pelts go for $25-$45 a pelt depending upon color and quality. If you are interested in keeping or selling the pelt use a smaller caliber rifle. Ever since he was a teenager, Bob has enjoyed taking older folks out hunting and fishing. Bob told me of the time a local retirement home called to ask if he could take one of their 92-year old residents fishing. The staff told Bob that all this man talked about was going fishing. Bob called the man’s daughter to get permission. With permission secured, Bob executed his plan. Bob showed up in the man’s room to tell the 92-year old that they were breaking him out. The old guy asked where they were going and Bob told him fishing. Bob said the man was so excited, but very concerned that the staff would catch them (of course they already knew). Bob said they were prepared for that and wrapped a poncho around the man and put a big Mexican hat on his head. And off they wheeled the man to go fishing! With their escape secured, they enjoyed a day fishing from Bob’s pontoon boat. Let’s talk snowshoe hare hunting with dogs…beagles…lots and lots of beagles. Bob has 27 beagles. Twenty-six females and one lucky male. It isn’t that the females have better noses, it’s that Bob thinks they focus better – mostly because they aren’t marking every tree and snowbank or peeing on each other. Having two male dogs, Bob’s viewpoint seems pretty valid. Bob thinks that March is the best time of year to hunt snowshoes. The hare are starting to congregate in anticipation of breeding. Bob hunts a couple dogs at a time in a cover, often setting down several groups of dogs to cover a larger area. Bob is clearly fond of his dogs. He breeds them specifically for hunting hare. Bob hunts some of his older dogs just an hour or so because they love to hunt and hate being left behind. He keeps his senior pack members long into their retirement. Bob commented that it’s the only right thing to do since they helped him to earn a living. The covers Bob hunts are named after deceased members of his beagle pack. Asked about the noise of 27 beagles around his lodge, Bob responded that they don’t hardly make a sound if you run them 9 miles a day. Bob has a local retiree run his pack about 9 miles a day along the logging roads. He swims the dogs next to his boat in the summer if it gets hot. I appreciate Bob taking the time to talk with me. I’m hoping to make it up to his lodge next March to hunt snowshoes and coyotes…and to pick up some stories of hunting and fishing in Maine.